Vally Wieselthier (1895 Vienna--1945 New York) studied at Vienna’s Kunstgewerbeschule (School of Arts and Crafts) with such illustrious teachers as Koloman Moser, Joseph Hoffmann and Michael Powolny. In 1917, while she was still a student, Hoffmann invited her to work with the Wiener Werkstätte (Vienna Workshop), the art and design manufacturing and sales collective founded in 1903 by Hoffmann and Moser, that pursued the ideal of the Gesamtkunstwerk (total artwork), a unification of artists and craftsmen of different disciplines in the creation of an overarching lifestyle concept. During and after World War I, more women were able to gain admission to the Kunstgewerbeschule, filling the vacancies left by men who fought and died in the conflict. As a result, more women began working with the Werkstätte, and they gained more responsible positions. Wieselthier started out at the Künstlerwerkstätten (Artists’ Workshops), which had been established by the Werkstätte in 1916, in response to its own war-diminished ranks. Here, young artists—many of whom were female students of Hoffmann’s—were given studio space and materials to create pieces for the Werkstätte. Wieselthier, who was to work primarily in ceramics, had ample space and resources at the Werkstätte to create. Augmenting its relationship with Wiener Keramik (Vienna Ceramics), which started around 1907, the Werkstätte began producing its own ceramics in 1917. However, in 1922, the Werkstätte's new managing director, Philipp Häusler, tried to engage the artist's on a fixed salary. "Our paradise was lost" Wieselthier recalled, and she left to open her own studio. In 1927, the Werkstätte bought her workshop and put her in charge. In contrast to the more cleanly designed and functional ware of the Werkstätte’s earlier years, Wieselthier and her fellow ceramicists created unique figurines and decorative pieces. Her work, considered among the most distinguished of the 1920s and 1930s, is characterized by an informal use of material, expressive color, and free adaptation of traditional forms and subjects. Wieselthier was included in the 1925 "Exposition Internationale des Arts Décoratifs et Industriels Modernes" (International Exhibition of Modern Decorative Arts and Industrial Design) in Paris. 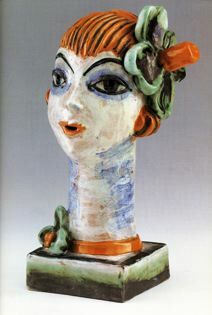 In 1928, the Metropolitan Museum of Art in New York included her work in its "International Exhibition of Ceramic Art." For the Wiener Werkstätte’s 25th anniversary in 1928, she designed, with Gudrun Baudisch, the sculptural cover of its commemorative publication. Wieselthier moved to New York in 1929.